Another iMovie project. A short one this time. Music: Looking for Angels by Skillet. I got the Nike+iPod kit with the birthday gift certificate that Victor gave me. I have to say the kit and my iPod nano are two of my best loved gadgets. I also like the nikeplus site where I can keep track of my runs, set running goals, watch my progress, and also join some running challenges. When I got the Nike+iPod kit, I already had my running shoes and I didn’t want to spend more money on a pair of special Nike shoes that has a special compartment to hold the sensor. So I searched around for other ways to attach the sensor to my shoe. I found several types of shoe wallets/pouches that will hold the sensor, but I needed something a little bigger to hold my keys as well. 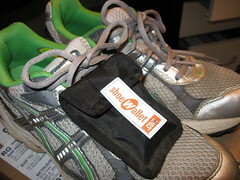 I finally settled on the shoewallet. It has worked well and has become part of my regular running wardrobe. 1) An Otherness experience: Attend an event where I am the “other” person and then write a report on it. For example, a White person can attend a Black church, or a Middle Class person can visit a homeless shelter. As for me, I thought this assignment is redundant, since I experience otherness every single day in the US. 2) A journal of my thoughts regarding my assigned topic (Race). Sort of a contrast between “before-taking-the-class” and “after-taking-the-class” to document any changes in my thoughts and opinions on the issue of Race. I really enjoyed writing that paper: it’s almost like at last I have been given a valid outlet to express my thoughts on this oh-so-sensitive issue. Here is an excerpt from my 6-page (double-space) paper. Keep in mind that I wrote this for an American professor who may not even know where Malaysia is, so instead of going into details about the conflicts, I have simplified some issues. Elizabeth Martinez’s article talks about racism in the United States being a Black-White model, racism in Malaysia has often times being seen as a Malay-Chinese model. In the battle between the Malay majority and the Chinese minority to gain control, one minority race, the Indians, the third race has been marginalized. The Malaysian government in their quest to make education seem more equal has implemented a new “meritocracy” plan for university admissions. Since the Malays and non-Malays take separate university entrance examinations, I am skeptical that admission is truly based on merit. With the implementation of the new merit system, last year’s university admission data showed that the Malays were still the dominant race entering universities, about 65%, while the Chinese maintained at 30%, but the Indians have dropped from 10% to 5%. Without the previous quota system, the new “meritocracy” has worked against the Indians. The Indian minority group has tried to ask the government to return to the previous quota system as many of their students were not able to gain admission into universities with this new system but the Malay-dominant government has make a decision that “meritocracy” is here to stay. It is being said that it is the Indians who lost everything in this battle for equality. The new “meritocracy” system, which was meant to bring about some equality in education, has pushed the Indians almost out of the picture. I now see that while I have some Chinese privilege, the Indians have been the most oppressed group. Since the system has always been about taking care of our own, the current system will foster a greater divide among the three major races in Malaysia. As I have faced racism and thought of the many injustice that occur in my life, I understand now that other groups have suffered too and often times have scars worse than mine. All along I have focused on being the oppressed but now I see that I had allowed that to be my rationale to harbor prejudice against others. I am still very much against the sort of affirmative action that is being carried out in my country. I am beginning to see the effects of it not only on my life but also on the society as a whole. I still hate the term racial quota and I am against the new university entry system that creates a false sense of “meritocracy”. Affirmative action has caused great divide in my country. While Malaysia may be called a peaceful multicultural country, many Malaysians hold grudges against the privilege other, may it be the Malay-majority privilege or the Chinese-economic privilege. The poor and less privileged are being left further behind. The affirmative action has disunified my country. While I would like to deal with racism, I do not see how I can affect societal or institutional change. I can only try to work on it on a personal and emotional level. I would have to work towards not letting racism and oppression consume me with hatred. I would have to work towards not letting it make me think of only me and myself. As I talked to people who are staying with roommates, I discovered that roommate issues are all too common. What I dislike about roommate issues is that I hate the way I am when I deal with household injustice (at least injustice from my point of view). I hate that I become calculative and picky. I am so determined not to be taken advantage of but at the same time I know I am called to serve others, and I struggle to do just that in my own apartment…sigh. 1. Have an uncomfortable talk about the trash issue and how the current situation stinks and that the “I will take the trash out when I feel like it” attitude is not good enough. And finally splitting the trash chore to one person taking out the trash on Monday-Thursday and the other person on Friday-Sunday. 2. Buy another trash can and label the respective trash can with the owner’s name. And each person will take out his/her own respective trash. All these conflicts over something so seemingly insignificant and yet it has the power to bring out the worst in a person. For some unknown reasons, I’ve dropped out of everyone’s must-invite-over-for-thanksgiving radar, so I planned a cook-something-nice-and-eat-alone thanksgiving meal. But that was not to be. Geraldine, my Cameroonian pal, gave me a call the day before Thanksgiving and I invited her over to share my Thanksgiving meal with me. 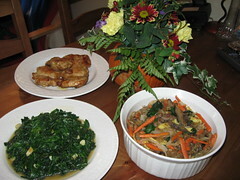 My original menu was Jabchae (Korean stirfried noodle with loads of vegetables) and baked belacan chicken. But cooking for people from different cultures can be rather tricky. I learned my lesson the first time I invited some African friends over for a meal. For that special meal, I made clear chicken soup with carrots, potatoes and onions, stirfried broccoli and carrots, and curry chicken. They spurned my chicken soup but liked my curry chicken and found the broccoli “interesting”. After some thought, I decided to stick with the Jabchae and belacan chicken (if she was white, I would steer clear of the belacan). I added the stir-fried collard greens, crossing my fingers that Geraldine would be ok with it. The meal turned out great, we had a good time chatting over ridiculous roommate issues, haunting past issues, and American cultural issues. 1. For the past many years, the residential office had held a Thanksgiving turkey lottery and gave out 5 frozen turkeys each year. No turkey lottery this year. 2. For the past many years, a local church had held a big thanksgiving dinner for the international students. No big thanksgiving dinner this year. 3. For the past few years, my church had held a donate-a-frozen-turkey-to-a-local-family event. No free frozen turkeys to local families this year. Are these signs of what’s to come? I guess I won’t be out doing any Black Friday shopping this year then. I had a really good day today. I went for the women’s conference in church from 8.20am- 2pm. Then dropped by the grocery store to get collard greens and turnip greens (will blog on these vegetables later). Went home, took a short nap, then went out for my 50 minutes of continuous running. Came home, took a short shower, rushed off to evening service. After the service, went to the chinese buffet to tah-pau some food for dinner. I thought I’d go to bed early since I’ve been running around a lot today but the iMovie bug would not let me sleep. So here is my latest iMovie about my beloved running trail. I’ve sort of mastered the Ken Burns effect. I’m still having trouble with the transitions and I save my work obsessively. I think I’m getting better at this. What do you think? My ridiculous video on the battle between homemade and store-bought food. The battle is fought to the music of Rebirthing by Skillet. Get it? Food and Skillet? I have to stop doing these early morning imovie projects. This project would have taken less time if I had remembered to always save my work. Lost a whole big chunk (actually lost all of it) when iMovie crashed! Last Thursday, I attended an iMovie/iDVD workshop at the local Apple store. I didn’t expect that I will be attending the workshop with two grandmas. They were both there to learn more about iMovie so that they can make movies starring their grandkids. Well, during the workshop, they definitely knew more about video editing than me. Gee, I thought I was part of the techy generation. Anyway, if I am to use a video-based intervention for my dissertation, I better start learning and getting good at it. So here is my very first iMovie. This took me about 4-5 hours to complete. The process was long and convoluted, so I’m definitely doing it wrong. I did not get permission to use the music and the photos in the video. Ironic, since I made a video about Bersih…hahaha. How near is the cross-country course to my apartment? After putting off running the “run 40mins, walk 1min, run 20mins” session for the past 3 days, I knew I had to go for the run soon. As I looked out my window, I saw small groups of runners out on the cross-country course. And it wasn’t just one group of runners but many small groups all over the place. I quickly checked the university’s sports website and found out that there’s going to be the National Collegiate Athletic Association (NCAA) Mid-Atlantic Cross-country Race taking place at Lehigh on Saturday. Since there’s going to be an official race on Saturday, I couldn’t put off my run till Saturday, so reluctantly I went out for my run. There were all these student athlete runners on the trail…very intimidating. So I went to do most of my run on the track but 40 minutes of round and round the track was absolutely boring. Eventually, towards the end of my run, I ventured on the cross-country trail and finished my run there. The big race for the many of the runners who were out on the course yesterday for their practice run. I was in my room and I heard some commotion outside. I quickly took my camera and started recording the race from my window. Now you can see the video and know that the cross-country course is REALLY near my apartment.